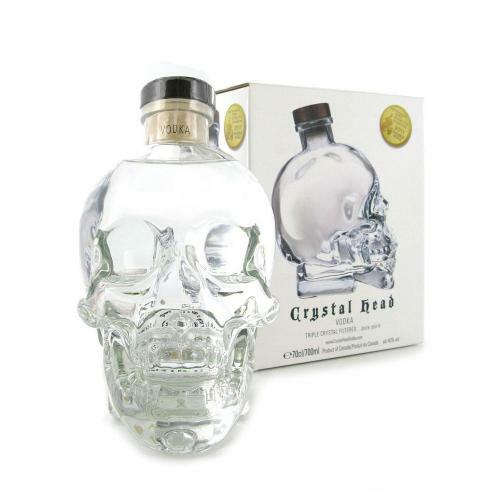 An eye-catching, skull-shaped bottle for comedy legend Dan Aykroyd's Crystal Head vodka. Double winner of the San Francisco world spirit competition, Dan Aykroyds crystal head Vodka is the purest form of vodka going through a quadruple distillation process and then filtered through 500 year old crystals making the vodka free of any additives. As for the bottle, the bottle itself is made by Bruni Glass in Italy, and the kosher-certified vodka is made with pure Newfoundland water and filtered through those 500-million year-old crystals known as Herkimer diamonds. Nose: Smooth and light with hints of vanilla which gently make their way around. Palate: When the vodka first hits the palate there is a slight kick but it quickly mellows into a smooth offering. Finish: A slight peppery kick at the end but a long, mouth watering kick dominates.